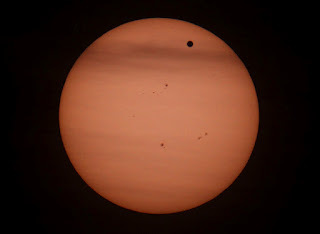 Venus is seen from the Vienna Urania observatory in Vienna as a dot as it transits across the Sun on June 6, 2012. Sky-gazers around the world held up their telescopes and viewing glasses on June 6 to watch Venus slide across the sun -- a rare celestial phenomenon that will not happen again for more than 100 years. The spectacle began shortly after 2200 GMT on June 5 in parts of North America, Central America and the northern part of South America, and was seen, with magnification, as a small black dot on the solar surface.